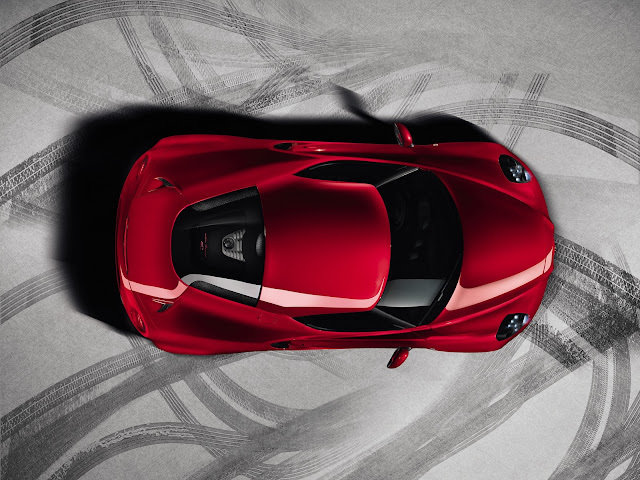 When the Alfa Romeo 4C was first announced the image above was released as part of a portfolio of photos. At the time I thought it looked quite square. The Alfa 4C is 1183mm tall by 3989mm long by 2090mm wide. In other words it is hugely, massively wide. I recently drove the Maserati GranTurismo Sport and commented how big it was. Normal parking spaces were almost impossible to use due to it's 1915mm width and long doors. The GranTurismo is 175mm narrower than the Alfa. Think of big cars and the Alfa out-wides them all. Range Rover - 2073mm, Rolls Royce Phantom - 1990mm, Ferrari FF - 1953, Mercedes SLS - 2075mm. The widest car on the road today is the Lamborghini Aventador and that is a mere 2030mm. The Alfa 4C will be 60mm (2 inches) wider than the Lambo. Yet the Alfa is being touted as a small, lightweight coupe. Yes it is lightweight at 895kg but it's about as practical as Tamara Ecclestone. The Jaguar F-Type is 1923mm wide and the Porsche 911 Turbo is 1880mm wide. The widest production car ever was the 1954 Chrysler Crown Imperial, at 2105mm. The Alfa 4C is just 2/3 inch off being the widest car ever.